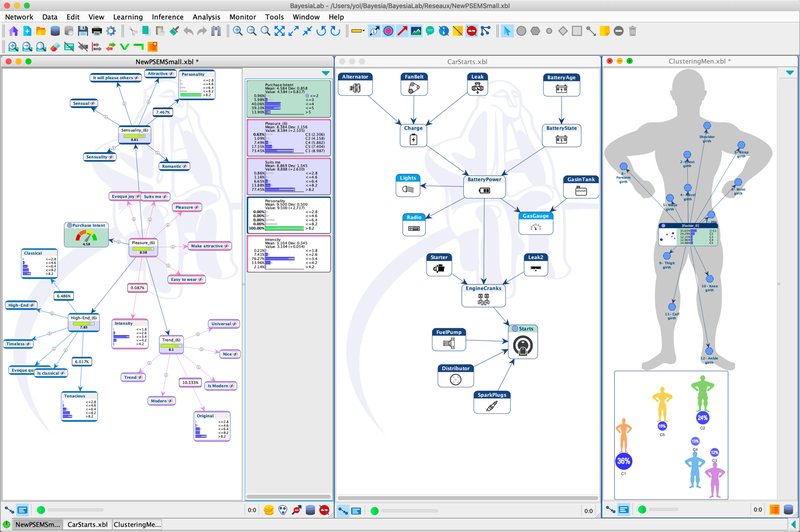 BayesiaLab is a powerful desktop application (Windows/Mac/Unix) with a sophisticated graphical user interface, which provides scientists a comprehensive “laboratory” environment for machine learning, knowledge modeling, diagnosis, analysis, simulation, and optimization. With BayesiaLab, Bayesian networks have become practical for gaining deep insights into problem domains. BayesiaLab leverages the inherently graphical structure of Bayesian networks for exploring and explaining complex problems. BayesiaLab is the result of nearly twenty years of research and software development by Dr. Lionel Jouffe and Dr. Paul Munteanu. In 2001, their research efforts led to the formation of Bayesia S.A.S., headquartered in Laval in northwestern France. Today, the company is the world’s leading supplier of Bayesian network software, serving hundreds major corporations and research organizations around the world. BayesiaLab is designed around a prototypical workflow with a Bayesian network model at the center. BayesiaLab supports the research process from model generation to analysis, simulation, and optimization. The entire process is fully contained in a uniform “lab” environment, which provides scientists with flexibility in moving back and forth between different elements of the research task.